Last week, former CFL head coach Marc Trestman was named the head coach and GM of the XFL's Tampa Bay franchise. Last week, the former CFL head coach was named the head coach/GM of the XFL’s Tampa Bay franchise. For Trestman, it’s a return to the state where he began his coaching career in 1981 as a volunteer assistant at the University of Miami and two years later was admitted to the bar. In fact, when XFL commissioner Oliver Luck approached Trestman about joining the league, Trestman said his preference was Tampa Bay because of his familiarity with the area. “I went to school here, I know the area,” Trestman said during a telephone interview. “I took the bar exam a couple of miles from the stadium, I’ve recruited the area so I have some familiarity here. The XFL is scheduled to begin in 2020 with teams also in Dallas, Houston, Los Angeles, New York. St. Louis, Seattle and Washington. But what also sold Trestman on the league was wrestling guru Vince McMahon’s financial commitment, having sufficient time to set up shop and Luck’s experience in start-up ventures and integrity. Luck, a former NFL quarterback and father of Indianapolis Colts starter Andrew Luck, served as NFL Europe’s president from 1996 to 2000. McMahon is reportedly prepared to spend over US$500 million in the XFL’s first three seasons. The XFL originally operated for one season in 2001. It was a mix of wrestling and football with then-WWF personalities such as Jesse Ventura, Jim Ross, and Jerry Lawler providing on-air commentary. Trestman spent seven years in Canada, compiling a 72-54 regular-season record with Montreal (2008-12) and Toronto (2017-18), the Alouettes’ post being Trestman’s first as a head coach. He reached four Grey Cups, winning three, and five times his team finished atop the East Division. 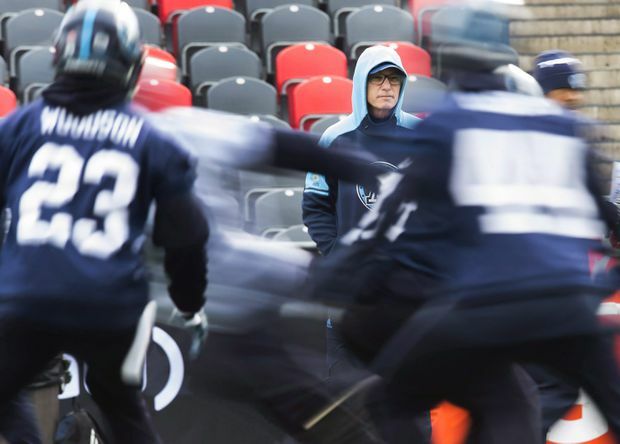 Trestman’s CFL tenure ended on Nov. 3 following Toronto’s season-ending 24-9 loss in Ottawa. The Argos posted a league-worst 4-14 record, the only time a Trestman-coached team missed the playoffs. It wasn’t the first time Trestman had been fired over a well-travelled coaching career that’s spanned the CFL, NFL and NCAA. But his dismissal came via a 2 a.m. phone call hours after Toronto’s regular-season finale. “When you’re in the football business, that’s a business that if you get caught up in all the other stuff it just takes your heart out of it,” Trestman said. “My heart’s always going to be in it regardless. Trestman said Toronto’s ‘18 record is definitely deceiving. “I thought this might’ve been one of my best coaching jobs,” he said. “One of my more enjoyable experiences to be able to teach people how to handle adversity and be able to do it the right way. “I absolutely loved living in the city of Toronto,” he said. “Of course, I love the CFL and what it’s done for my life. When the XFL begins play, it will become the second spring league along with the Alliance of American Football. But Trestman doesn’t see the two circuits as direct competitors. “Well, here’s how I look at it,” he said. “First of all, it’s being played in different areas.